Died: May 22, 1802 (aged 70) Mount Vernon, Virginia, U.S.
Martha Washington (née Dandridge; June 13 [O.S. June 2] 1731– May 22, 1802) was the wife of George Washington, the first president of the United States. Although the title was not coined until after her death, Martha Washington is considered to be the first First Lady of the United States. During her lifetime she was often referred to as "Lady Washington". Widowed at 25, she had four children with her first husband Daniel Parke Custis. 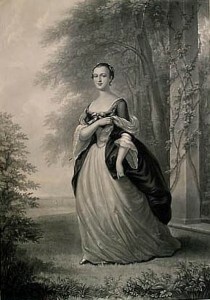 Two of her children by Custis survived to young adulthood. She brought great wealth to her marriage to Washington, which enabled him to buy land and many slaves to add to his personal estate. She also brought nearly 100 dower slaves for her use during her lifetime; they and their descendants reverted to her first husband's estate at her death and were inherited by his heirs. 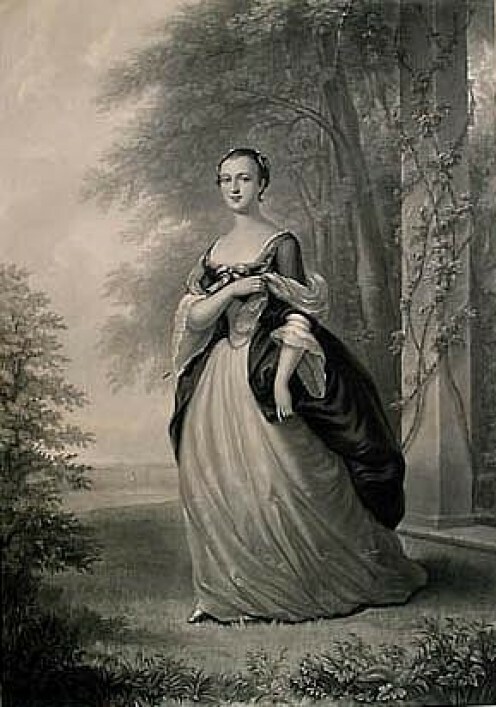 She and Washington did not have children together but they did rear her two children by Daniel Parke Custis, including son John "Jacky" Parke Custis, as well as helped both of their extended families. Martha Dandridge was born on June 13, 1731 (O.S. June 2) on her parents' plantation Chestnut Grove in the British colony, Province of Virginia. She was the oldest daughter of John Dandridge (1700–1756), a Virginia planter and immigrant from England, by his wife Frances Jones (1710–1785), who was of American birth and English, Welsh, and French descent. Martha had three brothers and four sisters: John (1733–1749), William (1734–1776), Bartholomew (1737–1785), Anna Marie "Fanny" Bassett (1739–1777), Frances Dandridge (1744–1757), Elizabeth Aylet Henley (1749–1800) and Mary Dandridge (1756–1763). Martha may have had an illegitimate half-sister, Ann Dandridge Costin (years of birth and death unknown) who was born into slavery; Costin's enslaved mother was of African and Cherokee descent, and her father was believed to be John Dandridge. Martha's father may also have fathered an out-of-wedlock half-brother to Martha named Ralph Dandridge (years of birth and death unknown), who was probably white. On May 15, 1750, at age 18, Martha married Daniel Parke Custis, a rich planter two decades her senior, and moved to his residence, White House Plantation, located on the south shore of the Pamunkey River, a few miles upriver from Chestnut Grove. They had four children together: Daniel, Frances, John, and Martha. Daniel (1751–1754) and Frances (1753–1757) died in childhood. The other two children, John (Jacky) Parke Custis (1754–1781) and Martha ("Patsy") Parke Custis (1756–1773), survived to young adulthood. Her husband's death in 1757 left Martha a rich young widow at age 25, with independent control over a dower inheritance for her lifetime, and trustee control over the inheritance of her minor children. In all, she was left in custody of some 17,500 acres of land and 300 slaves, apart from other investments and cash. 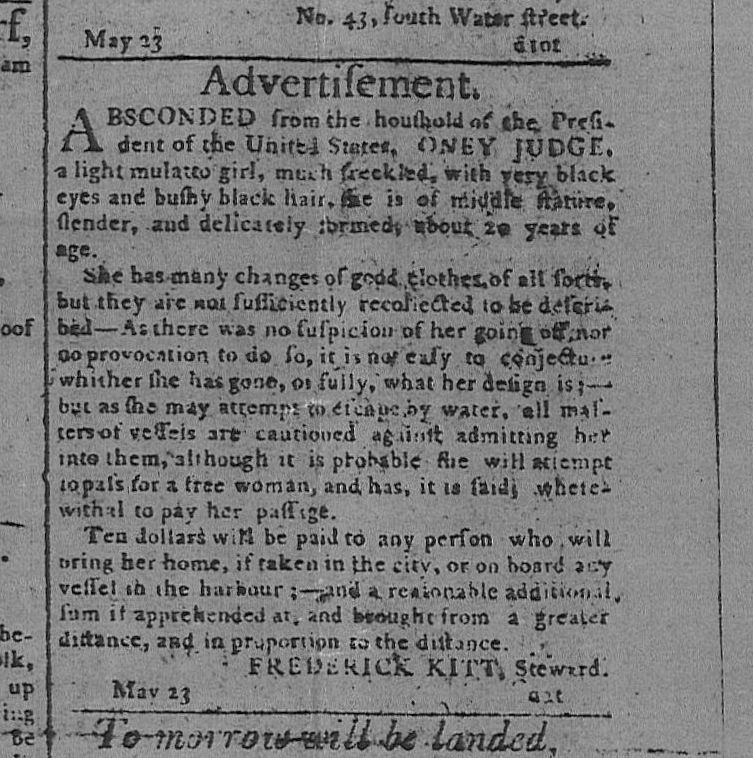 According to her biographist, "she capably ran the five plantations left to her when her first husband died, bargaining with London merchants for the best tobacco prices." 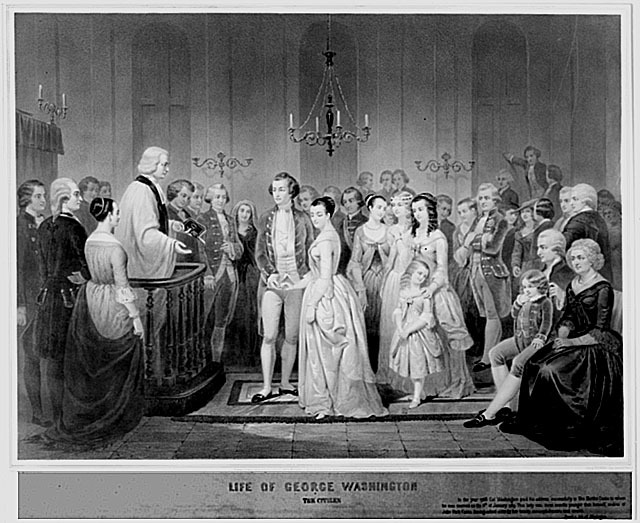 Martha Dandridge Custis, age 27, and George Washington, age nearly 27, married on January 6, 1759, at the White House plantation. As a man who lived and owned property in the area, Washington likely knew both Martha and Daniel Parke Custis for some time before Daniel's death. 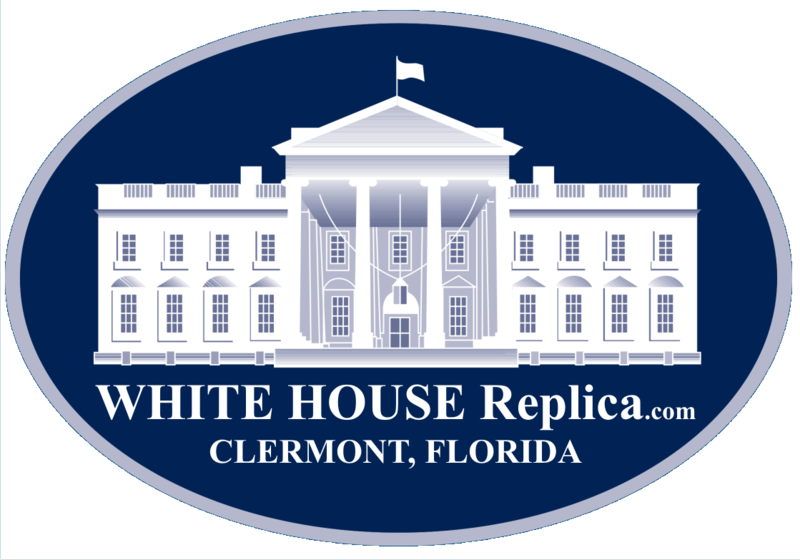 During March 1758 he visited her twice at White House; the second time he came away with either an engagement of marriage or at least her promise to think about his proposal. At the time, she was also being courted by the planter Charles Carter, who was even wealthier than Washington. The wedding was grand. Washington's suit was of blue and silver cloth with red trimming and gold knee buckles. The bride wore purple silk shoes with spangled buckles, which are occasionally displayed at Mount Vernon. The couple honeymooned at White House for several weeks before setting up house at Washington's Mount Vernon estate. They appeared to have had a solid marriage. Martha and George Washington had no children together, but they raised Martha's two surviving children. Her daughter, nicknamed Patsy, died as a teenager during an epileptic seizure, classed as SUDEP. John Parke "Jacky" Custis returned from college to comfort his mother. Custis later married and had children; he served as an aide to Washington during the siege of Yorktown in 1781 during the American Revolutionary War. He died of "camp fever" (probably epidemic typhus). After his death, the Washington's raised two of John's four children, Eleanor (Nelly) Parke Custis (March 31, 1779 - July 15, 1852), and George Washington Parke Custis (April 30, 1781 - October 10, 1857). They also provided personal and financial support to nieces, nephews and other family members in both the Dandridge and Washington families. 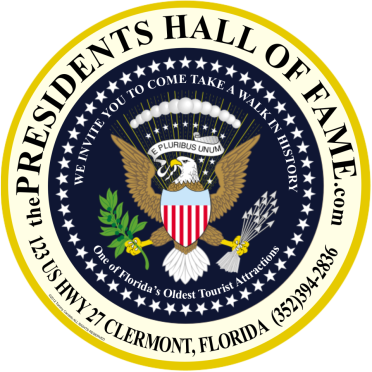 After the war, she opposed George Washington's agreeing to be President of the newly formed United States of America, and she did not attend his inauguration on April 30, 1789. Once he assumed office, as the First Lady Martha Washington hosted many affairs of state at New York City and Philadelphia during their years as temporary capitals. The socializing became known as "the Republican Court". In July 1790, the artist John Trumbull gave a full-length portrait painting of General George Washington to her as a gift. It was displayed in their home at Mount Vernon in the New Room. Although her father owned only fifteen to twenty slaves, her first husband, Daniel Parke Custis, owned nearly three hundred, making him one of the wealthiest men in the Virginia colony. The full Custis estate contained plantations and farms totaling about 27 square miles (70 km2), and 285 enslaved men, women, and children attached to those holdings. Daniel Parke Custis' death in 1757 without a will meant that, according to law, his and Martha's eldest male child, John (Jacky) Parke Custis, who was at that time a minor, would inherit when he became an adult two-thirds of the Custis estate, its slaves and the children of those slaves. Martha received a "dower share," the lifetime use of (and income from) the remaining one-third of the estate and its slaves. After her death, the dower slaves and their progeny were to be distributed among the surviving Custis heirs. Upon his 1759 marriage to Martha, George Washington became the legal manager of the Custis estate, under court oversight. At the time of her marriage, Martha's dower share included more than 80 slaves; she also would control any children they had, as they would become part of the dower. Estate records indicate that Martha Washington continued to purchase supplies, manage paid staff, and make many other decisions. Although the Washingtons wielded managerial control over the whole estate, they received income only from Martha's "dower" third. The remainder of the income went to a trust held for Jacky Custis until Jacky reached maturity. Washington used his wife's great wealth to buy land and slaves; he more than tripled the size of Mount Vernon (2,650 acres (10.7 km2) in 1757; 8,251 acres (33.39 km2) in 1787). For more than 40 years, her "dower" slaves farmed the plantation alongside her husband's. By law, neither of the Washingtons could sell Custis lands or slaves, which Martha's dower and the trust owned. After Jacky died during the Revolutionary War, his slaves passed to his son, George Washington Parke Custis, who at the time was a minor. If Jacky's trust or Martha's dower owned a slave's mother, they also held the mother's children. Some slaves owned by the Washingtons and the trust married each other, forming linked families. Seven of the nine slaves whom President Washington brought to Philadelphia (the national capital, 1790–1800) to work in the President's House were "dowers." Pennsylvania passed a gradual abolition law in 1780, under which non-residents were allowed to hold slaves in the state for up to 6 months; after that date, they could claim freedom. The Washingtons rotated their President's House slaves in and out of the state before the 6-month deadline to prevent their establishing residency (and legally qualifying for manumission). Washington reasoned that should the "dowers" attain their freedom due to his negligence, he might be liable to the Custis estate for their value. "Martha felt a responsibility for the unsophisticated girl under her care, especially since her mother and sister were expecting to see her back at Mount Vernon. What she could never understand was that [Oney had...] a simple desire to be free. Ona, as she preferred to call herself, wanted to live where she pleased, do what work she pleased, and learn to read and write [...] Ona Judge professed a great regard for Martha and the way she had been treated, but she couldn't face a future as a slave for herself and her children." Washington's slave Hercules, who had worked as his chief cook at the President's House (Philadelphia) before being returned to Mount Vernon in 1796, escaped from there on February 22, 1797. He was known to have traveled to Philadelphia and by December 1801 was living in New York City. His six-year-old daughter, still enslaved at Mount Vernon, told a visitor that she was glad her father was free. In his July 1790 will, written a year after he became President of the United States in April 1789 and nine years before his death in December 1799, George Washington left directions for the emancipation, after Martha Washington's death, of all the slaves that he owned. Of the 318 slaves at Mount Vernon in 1799, a little less than half, 123 individuals, belonged to George Washington. His will stipulated that his slaves were not to be freed until Martha's death because of his desire to preserve the families of those who had intermarried with Martha's dower slaves. In accordance with state law, George Washington stipulated in his will that elderly slaves or those who were too sick to work were to be supported throughout their lives by his estate. Children without parents, or those whose families were too poor or indifferent to see to their education, were to be bound out to masters and mistresses who would teach them reading, writing, and a useful trade, until they were ultimately freed at the age of twenty-five. In December 1800, Martha Washington signed a deed of manumission for her deceased husband's slaves, a transaction that was entered into the records of Fairfax County, Virginia, but lost during the American Civil War. The slaves received their freedom on January 1, 1801, a little over a year after George's death. Martha’s health, always somewhat precarious, declined after George Washington's death. Two and a half years after the death of her husband, Martha died on May 22, 1802 at the age of 70. Following her death, Martha was interred in George Washington's tomb vault at Mount Vernon. In 1831, the surviving executors of Washington's estate removed the bodies of George and Martha Washington and those of other members of the family from the old vault to a similar structure within the present enclosure at Mount Vernon. Martha did not emancipate any of her own slaves during her lifetime. Her will bequeathed Elisha, a slave that she owned outright at the time of her death, to her grandson, George Washington Parke Custis. Upon her death, her dower slaves reverted to the Custis estate and were divided among her four grandchildren. The division split up families, divided husbands from wives and sent children away from their parents.